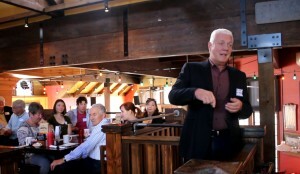 ST. GEORGE – Democratic gubernatorial hopeful Mike Weinholtz paid a visit to Southern Utah and spoke at a gathering of the Washington County Democrats Wednesday morning. 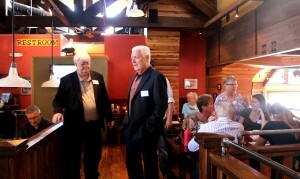 Weinholtz said he is proud to run as a Democrat and is not a “Republic light” candidate. 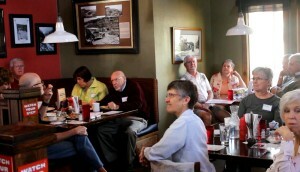 “I feel there needs to be a balance in government,” Weinholtz said during a meeting with county Democrats at George’s Corner in St. George, citing it as one of the reasons he decided to run for the governor’s seat. The Republican super-majority in the state has evolved to the point where politicians feel they don’t have to listen to the people, Weinholtz said. They simply do whatever they want, often putting politics ahead of the people. A majority of Utahns wanted Medicaid expansion, Weinholtz said, and the Republican-dominated Legislature didn’t do it. “(They) put politics and ideology first,” he said, adding he would do the opposite. Weinholtz is the co-founder of CHG Healthcare Services, a medical staffing company. Formed in 1979, it has grown to employ over 2,000 employees across the country and puts 10,000 physicians to work annually. Weinholtz said the company has become what it is today by following a philosophy of putting people first. Through his company, Weinholtz said he has gained experience running a large organization, managing large budgets and also working with people holding diverse opinions. He also touts himself as a fiscal conservative and a pragmatic problem solver. “I have the experience to run for governor, and I want to bring my philosophy of putting people first to government,” he said. While touting his business experience, Weinholtz also left little question as to his political affiliation. Why vote for a “lesser Republican” when you can just go for the real thing, he said. Weinholtz’s words resonated with some Democrats at the gathering. “I love that he addressed the fact that there’s so many ‘Republican Light’ candidates,” said 20-year-old Dixie State student and Democrat Nicole Gregory. After hearing Weinholtz speak, Gregory said she believes he may very well be what Utah needs. Dorothy Engelman, former Washington County Democratic Party chair, said she also liked Weinholtz and his message. “It’s refreshing to hear from someone who has put together a business, has the wherewithal and the presence to run (and) is running as a Democrat,” Engelman said, adding she liked how Weinholtz described himself as a “proud Democrat” who will run on Democratic principles, and not as the “Republican Light” he mentioned. Related to some of the issues facing the state, and particularly Southern Utah, Wienholtz spoke briefly about public lands and the Lake Powell Pipeline. “I think there is a compromise situation,” he said, referring to the ongoing tug-of-war between state officials and the federal government over management of public lands. Some public lands can likely flourish under state control, Weinholtz said, although he doesn’t believe millions of acres should be handed over for potential real estate and energy development. As to the Lake Powell Pipeline, Weinholtz said he’s heard from both Republicans and Democrats who don’t want it. People have told him it’s not needed and the final price tag could be as high as $4 billion. Weinholtz is not the only Democrat eying the governor’s seat. Democrat Vaughn R. Cook has also filed to run and will be seeking the state party’s nomination. The Washington County Democratic caucus will be held next Tuesday. On the EDge: Will 2016 be most historic presidential race?